Whether you want to repair metal items around the home, get involved in a metal working hobby, or work with metal as part of your job, a welding machine is the most flexible way to join metal pieces. There are several types of welding processes, the four main types are described below. Oxyacetylene Welding - A torch that burns a mixture of acetylene gas and oxygen. The heat produced is 6,300 degrees Farenheit. 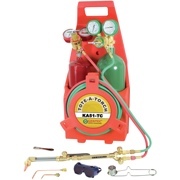 An oxyacelylene torch can be used to braze, solder and weld. It can also be used to cut steel (but not aluminum or stainless steel). The basic welding principles of heat control used with a flame torch apply to other types of welding, as a result, oxyacetylene welding is usually the first type of welding taught to new student. Stick / Arc Welding (SMAW) - Electricity is run through a stick electrode (usually steel, aluminum or stainless steel) creating an arc with the material to be welded. The stick electrode melts, providing the filler material for the weld. Arc welding is one of the more difficult types of welding to learn. Mig Welding (Wire feed / GMAW) - Mig systems use a wire electrode fed through a gun to make a weld puddle. Most systems have the option of using flux-cored wire or a shielding gas. Mig welding is the easiest type of welding to learn; the average homeowner can buy a mig welder at the hardware store, take it home and be making decent welds within a few hours of practice. Tig Welding (Heli-Arc / GTAW) - Tig systems use an electrode shielded in an inert gas to make a weld puddle, a welding rod is stuck in the arc to make the weld bead. Tig is the high-end welding; tig welds are neater and probably stronger than those from any other welding process. Power Requirements - 120 Volts, 230 Volts 1-phase, 230 3-phase, 440 volts. Duty Cycle - the percentage of time a welder can be used at its maximum output before it must rest. For example, a 30% duty cycle at maximum power can be used for 3 minutes, then must rest for 7 minute. At 50% power this welder could be used for more than 3 minutes out of 10 (the exact amount is usually specified by the manufacturer). Overload Protection - many welders have thermal switches that will shut off the welder if the duty cycle is exceeded. Capacity - the types of metal and thicknesses that can be welded depends upon the welding process and particular machine. 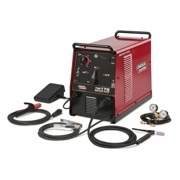 Generator - many Mig, Tig and Arc welders are available with built in gasoline generators to work in remote areas. What type of materials will you be welding? How thick of material will you be welding? Choose the process that covers the types of metals you will most likely be using. Will you be welding in the same location or do you need portability? The maximum portability is from Oxyacetylene welding. 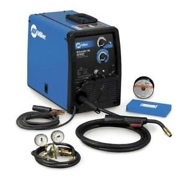 Mig, Tig and Arc welders with generators are available, but cost significantly more. What type of wiring do you have in the weld locations? 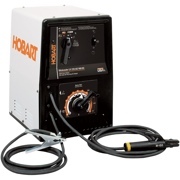 A welder that uses 230 Volt 3-Phase power can't easily be taken to a customer's location. How much experience do you have welding? How much time do you have to learn to weld? How important is weld appearance? Mig welding is one of the easiest to learn. Tig welding will likely create the best looking welds.